A pottery ewer, the rounded body is supported on a tall, stepped foot with flat base and is surmounted by a slender neck that rises from a single ridge and terminates in a mouth that is pinched into a trefoil shape. The mouth is joined to the body by a double strap handle, which is ornamented by two circular studs and a scrolled finial. Thin engraved lines encircle the base of the neck and the shoulder of the ewer. The upper part of the pottery body is covered in a carefully splashed sancai glaze of green, amber and cream colours that stops well short of the unglazed foot in an uneven line, where it shows the purity of the clay. This superbly potted and elegant miniature pottery ewer with its pinched spout and subtle double-strap loop handle is an excellent example of the capabilities of the Tang potter and also shows the influence of metal ware from West Asia. The typical Tang sancai glaze of splashed green, amber and cream tones is employed to great effect. 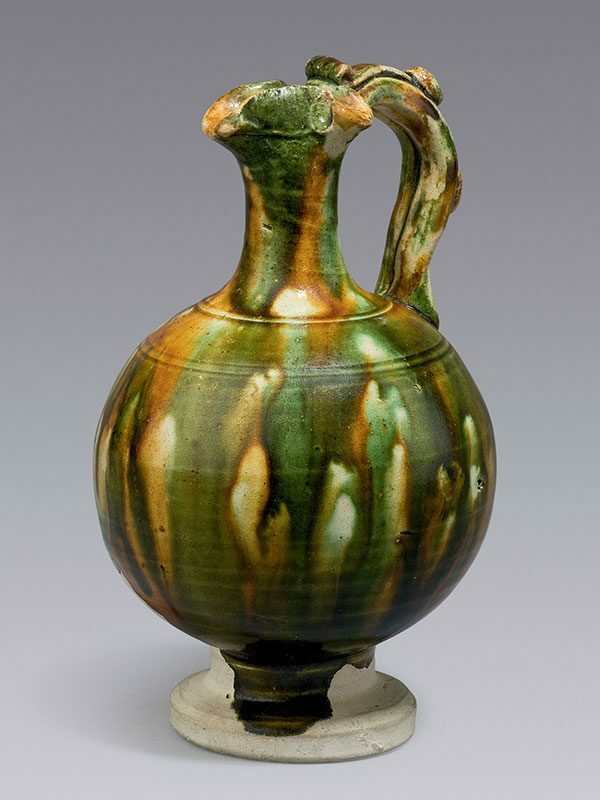 The present ewer is closely similar to a slightly smaller example in the collection of the Victoria and Albert Museum in London, which was included in the 1977 exhibition Early Chinese Miniatures at the China Institute in America. Two closely comparable miniature sancai ewers, slightly smaller in size and covered in blue, brown and yellow glazes, are dated to the first half of the 8th century and are in the collection of the Det Danske Kunstindustrimuseum in Copenhagen. There are many versions of the basic model; a much larger sancai ewer with grooved body is in the Meiyintang collection. Another example, also of much larger size, is in the Idemitsu collection in Tokyo.